Here’s our fantasy premier league tips midfielders GW24 article in our player rankings series. There’s a table of stats to help you make your transfer choice. I’ve generally started with a selection of midfielders that I think will start GW24 and have some longevity in the team. 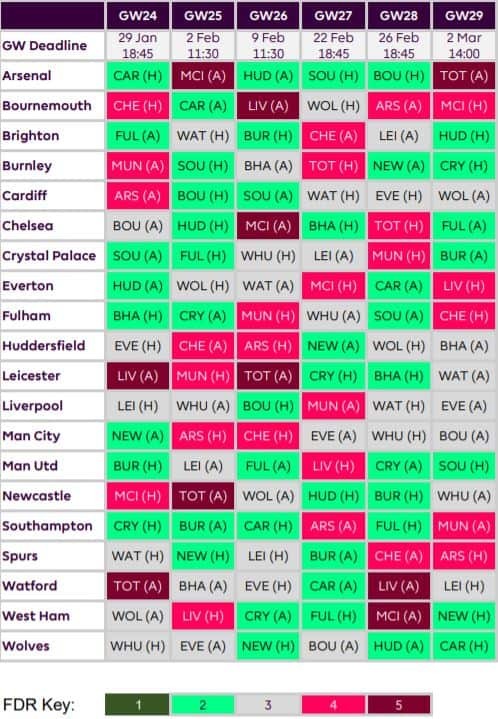 DGW means they have a confirmed double gameweek which at the moment is GW25. There is no extra ranking boost for a DGW if followed by a blank week as over 6 games this is assumed to even out. Teams with just blanks though with no doubles to compensate are taken as playing less games and adjusted accordingly. The schedule ranks players by the FFG projected PPG over the next 6 games. I’ve not included Son HM as there seems to be some doubt over whether he will start GW24 due to fitness issues. Also De Bruyne I’d like to see start a league game. Anyone think Ward-Prowse is worth a shout…..? Reasonable price and some decent fixtures. doesn’t seem there is any such thing as a 1 on that FPL fixture thing. Ah, see what you mean, I think…. When it’s the double chelsea gameweek, as it does not sparse in week 25, like the man city v everton game?